The company produces roof tiles with an integrated photovoltaic system, which allows innovative solutions. The solar roof tiles are lightweight, easy to install and contribute to climate change mitigation. Eighteen jobs have been created. 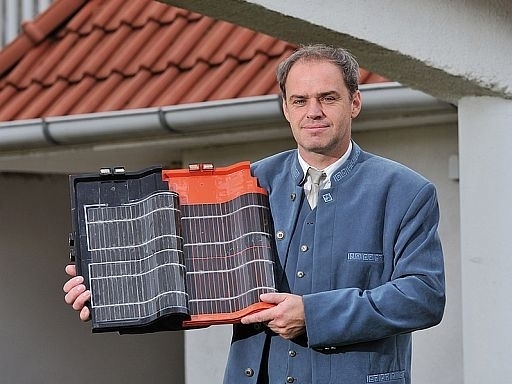 The dual challenges of mitigating climate change and adapting to its effects, particularly in rural areas, was the spur for a Hungarian entrepreneur to expand the capacity of his production facility for solar cell roof tiles. Having already developed this state-of-the-art technology, the new challenge was to meet growing demand for the product from numerous other regions and countries. Responding to the raised priority given in the Health Check of the Common Agricultural Policy (CAP) to mitigating climate change, the main aim of the project was to expand production of photovoltaic roof tiles to match market demand, while simultaneously creating employment in the rural area of Harsany. Construction and equipping new factory premises to expand production capacities were the main activities. This involved preparation of a well-researched business and financing plan, application for planning permission, and proceeding with construction and equipment installation after approval of the project. Production capacity has expanded greatly, 18 new jobs have been created, and the business is now more profitable. Recognition of the innovative quality of the solar tiles has come through winning the Genius Europe 2009 award. Between 20% and 40% greater energy efficiency is achieved with these tiles compared to conventional solar modules. Stand-alone photovoltaic systems are built into each tile, so there is no need for separate electric cabling and roof weight loads are lighter. Time and effort invested in the planning stages pays off when it comes to securing support and the necessary finance from the relevant authorities for such a project.